A Source is a feed of health or fitness information and collects one type of data, including Activity, Body Composition (Weight), Blood Pressure, Glucose, Nutrition, Oxygen, Sleep, or Temperature information. Once the data is read into FitnessSyncer, it is available on our Dashboard, Stream, Calendar, Daily Analyzer, Your Best, and Destination Tasks. Type: Each Source is for one type of data. Name: A name for your quick identification; if left blank, FitnessSyncer will automatically populate it. Context: Only available for Pro users, allows you to put in a grouping context for Charts. Group: Only available for our Research users, allows you place participants into a group number for participation. Authentication: Based on the service you have selected, this is the permissions required to access it. Some services may require a username and password, while others require you to grant us permission on their sites. For more information, see Permissions. Use this Source: If this checkbox is not checked, this source will not be refreshed or used. Ignore Daily Calories: For services like Fitbit or Microsoft Health, we will take the full daily burn of calories as the default. Check this to use either the service’s calculation of step calories or 0. Note: This is not available within our Apps. 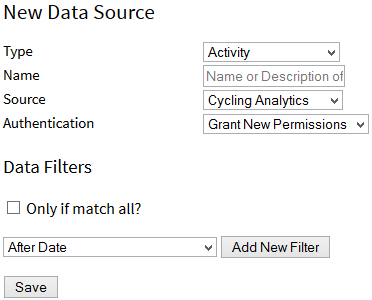 Filters (in Advanced Options): You can filter how the data is used from each source in many ways; see the Filters section for more information. Note: This is not available within our Apps.